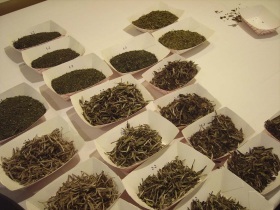 Building on the essential groundwork presented in Level One, Foundations of Tea: Level Two will examine CTC tea production and manufacture, as well as blending, flavoring and scenting, and introduction to sensory evaluation of teas. Also included is an introduction to the principles of grading and naming teas by country of origin. This seminar will allow attendees to ex-amine and taste 5-6 pairs of teas as they are guided through the basics of a comparison cupping of the 5 tea types.